Who says it doesn’t pay to be a Doin Work fan? First we brought you great discounts on clothes, and now we’re bringing the NBA to you. Here’s a special offer for those you in the Sacramento area. Click on the link below to get discounted ticket prices, NO service charge, and tickets to be printed at home. If you haven’t seen Rookie of the Year frontrunner, Tyreke Evans yet, you need to get out to Arco Arena. The Kings, already within two wins of their total from last year, will welcome back leading scorer Kevin Martin this week as well. This entry was posted on Wednesday, January 13th, 2010 at 4:21 pm	and tagged with arco arena, basketball, Kevin Martin, kings tickets, NBA, sacramento, sacramento kings, tyreke evans and posted in Sports. You can follow any responses to this entry through the RSS 2.0 feed. « Techno Rap Super Bowl Shuffle? 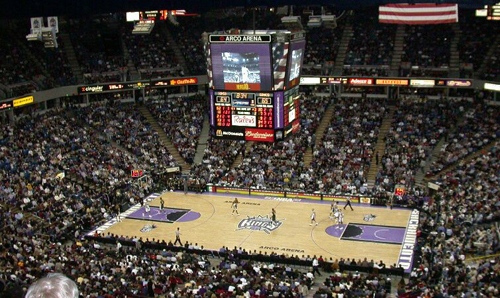 If that’s what it’ll get fans into ARCO Arena to see the likes of Tyreke Evans and Kevin Martin play , then why not. It’s not as if there’s anything else better that the Sacramento Kings have to offer to begin with. Well, the $1 beer night was pretty successful! Well a $1 beer is better than having to pay as much $4-$5 for one at an NFL game. By if things continue to go further south regarding the tenuous situation between the Kings and the city of Sacramento , do you think that they’ll look to move out of ARCO altogether ? There also rumors that there’s a bidder out there willing to buy the team from the Maloof family. $4-5??? Wow. Out here in CA you’re looking at $8-10 typically. I’m not overly optimistic about a new arena being built. However, I can’t really see the Maloofs moving the team. Obviously Sacramento is a great market, they just need to get back to winning so the fans get back on board. It’s clearly happening too, as attendance appears to be going up. I don’t expect anything to happen anytime soon on that front though. At this moment in time it’s tough for any professional sport’s franchise. And in particular those within the NFL, NBA , NHL and of course MLB</a?. But it really hurts those 'teams' that are viewed as 'mid' to 'small market' teams. That's not to say that the likes of the Yankees, Mets , Lakers and Cowboys aren’t hurting because they are. But because their financial resources are larger than most they ought to be able to weather the storm. Mind you with the Mets’ Wilpon family having had $600 million wiped off the family fortune because of the ‘Madoff scandal’. I’m not at all now sure about the Mets’ long term future.